Treadstone Products, the well-respected supplier of branded garden accessories, launched its new innovative Clip Glove product at GLEE with visitor reaction suggesting the Wrexham-based business is on to a winner. Clip Glove offers a new take on garden gloves with built-in professional DNA and a touch of genius. The gloves don’t just look good but offer great performance and protection. The addition of an aluminium carabiner clip to keep them together when being displayed on the shop floor or stored away by the gardener means no more lost gloves too! Dean Winters, Treadstone’s Head of Brands, said: “We had a fantastic response to our new range launch at GLEE. The enthusiasm from retailers for the Clip Glove concept was universal. Retailers appreciated the Carabiner clip and how it prevents torn header cards and allows consumers to try on both gloves easily in store - plus of course how it enables the end user to clip the gloves to their belt ensuring their gloves are always to hand. “The space-efficient glove spinner also received great comments. 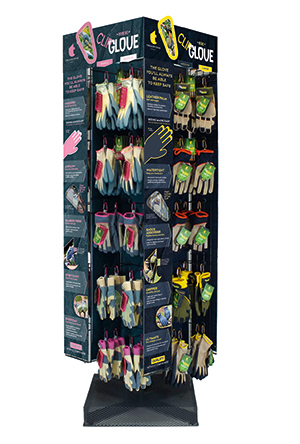 Holding 240 pairs of gloves in less than 0.4m2 of floor space, the clever unit incorporates a sizing guide and product information for each SKU to help consumers find the right glove. Retailers we met on our stand, and at the GIMA ‘meets the buyers’ sessions, were pleasantly surprised that the premium range has retailed starting at just £3.99." Available in two colour palettes, and light, medium and heavy-duty options, the new Clip Glove range have a pair to suit everyone from the occasional to the keen gardener. The range is made using carefully selected textiles from skin friendly bamboo fibres to technologically advanced cut proof yarns and synthetic leathers. Clip Gloves are available in small, medium and large sizes with merchandising units featuring an easy sizing guide to help customers select the perfect size for them. With an exclusive distribution of a number of internationally recognised brands in the garden sector, Treadstone Products is one of the leading suppliers of garden products to garden centre chains and independents. Manchester-based pet bedding and accessory specialists Scruffs® have confirmed their participation at this year’s Zoomark® in Bologna next month.